For the past two months, ESPN RISE visited nine of the nation’s most famous streetball courts leading up to the 2010 Boost Mobile Elite 24. The game will be played Aug. 28. (7:30 p.m. EDT on ESPNU) at the iconic Venice Beach Courts in Venice Beach, Calif., our last stop in the Rucker To Venice streetball series. Location: 1800 Ocean Front Walk, Venice, Calif.
League info: The Venice Basketball League kicked off its third season June 20. The championship, all-star game and celebrity game are set for Sept. 4. In this pro-am league, it’s invite-only, but it’s free. Court setup: There are three and a half courts along Ocean Front Walk — three by the boardwalk and one by the Venice Beach offices. One court does not have a rim or backboard on the north end. The court parallel to the boardwalk has the highest level of play and draws the biggest crowds. Surface: Asphalt; the court closest to the offices has the best playing surface. The VBL plays its weekly games there. This court also hosts the 2010 Boost Mobile Elite 24. Rim style: Single rims with nylon nets. The rims have some give, but jump shots are tough with the cool Venice breeze. Lights (yes/no): No. You can get there as early as 8 a.m., and play lasts until sunset around 8 p.m.
Best time for a run: The best runs are on weekend afternoons, particularly Sunday. Be careful because sometimes SoCal beach temperature drop fast in the evening. Level of competition (pickup, out of 10): 4-9, depending on the court. The level of comp decreases as you move further from the boardwalk. Style of play: 5-on-5 full-court pickup with streetball rules; half-court games are played on lower-level courts. Unwritten rules: To get in a pick-up game on the main court, you better have patience. “You might be here all day for three games,” warned streetball player Eugene Wright. 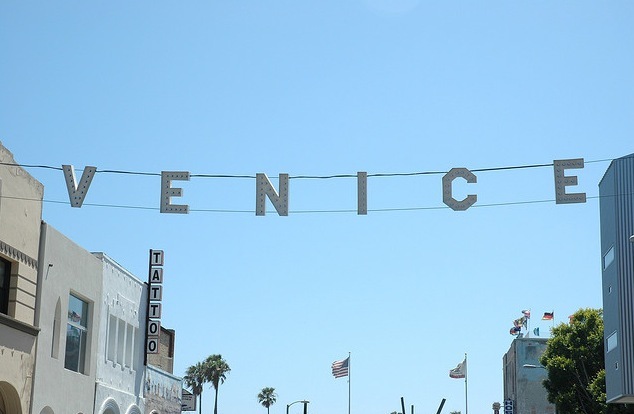 Arguing fouls or possession on close calls is a Venice Beach tradition. On busy weekends, the name of the person who’s got next is written on a list kept in the safe hands of Milt Berger, a regular there for two decades. Unless you’re a known player, you also can’t walk away and expect to keep your spot on the list. Winners choose which court they’ll play offense on (its usually the north end on the main court). In the VBL, if a player is fouled while shooting, his team is awarded points, not free throws. As you can imagine, cheap fouls are frowned upon in pick-up games. Today’s top ballers: Air Dogg,“J-Boogie” Brantley, Sidney Faison, Eric “Spinmaster” Holmes, Erron “E Money” Maxey, Timothy “Prime” McGrath, Maurice “Mo” Spillers, Jude “Hollywood” Thomas, Terron “Beast” Williams, Eugene Wright. NBA alumni: Gilbert Arenas, Ron “Tru Warrior” Artest, Kobe Bryant, Michael Cage, Chris Childs, Keith Closs, Baron Davis, Shaun Livingston, Tyronn Lue, Jannero Pargo, Paul Pierce. Streetball legends: Ron Beals, Kenny “Bad Santa” Brunner, Eldridge “El Hud” Hudson, “Ironman”, Robin “Syk Wit It” Kennedy, Demetrius “Hook” Mitchell, John Staggers, Freeman Williams, Larry “Bone Collector” Williams. Overtime: Streetball dates back to the late 1960s at Venice Beach when pros and street icons like James “Arkansas Red” Allen used to battle at Joe Weakley’s Run, Shoot and Dunk League at Denker Park in South Los Angeles. Arkansas Red, a native of West Palm Beach, Fla., and Raymond Lewis are L.A.’s original and most revered streetball icons. It wasn’t until 1979 when native New Yorker Kenn Hicks founded the National Outdoor Basketball Championship, and ran it Labor Day weekends at Venice Beach, that streetball in Los Angeles went mainstream.